Handmade 100% Natural Herbal Soap. 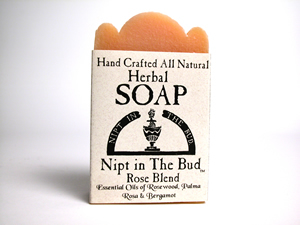 Nipt in The Bud is a Rose blend. It contains the essential oils of Rosewood, Palma, Rosa, & Bergamot. Only the purest aromatherapy essential oils of flowers and herbs are used. The soaps are unsurpassed in their mildness and quality. Necessary ingredients include coconut oil for a rich creamy lather, olive oil as a moisturizer,and palm oil to insure a long lasting bar of soap. 100 percent biodegradable and cruelty-free.